Luckily when I stopped by I was able to talk to Steve Forsyth the Owner and Brewer and get a tour of the brewery. I am guessing they will probably offer tours to the public in the future but at this point the brewery is usually closed to the public. They did just open so I am sure they need to figure out what their staffing situation will need to be. The brewhouse itself is a 20 Hectolitre system witch is actually a pretty good sized system. The gain is held on a Mezzanine and from that height the grain is milled and sent to the brewhouse. I forget how many bright tanks they have but they will be used for their Lagers and Pilsners. They plan to always have a few high quality Lagers and Pilsners on tap to fill a hole that our local brewing scene has. Take a break in the next few days and stop in the the brewery and see what your think of the latest addition to Vancouver scene. Both Steve and Trigger are very friendly people and you will be sure to enjoy your time there. 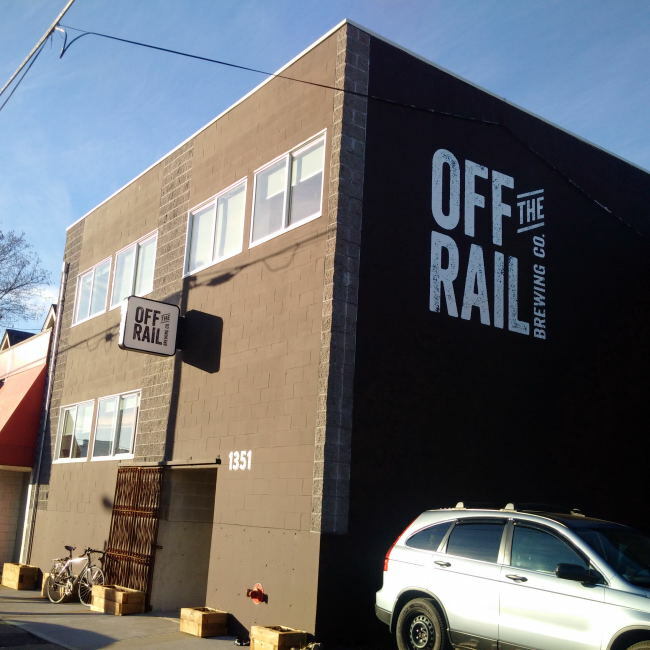 This entry was posted in Brewery and tagged adanac, beer, brewery, brewhouse, craft beer, east van, east vancouver, off the rail, off the rail brewing co, vancouver.